The Siege of Leningrad (Russian : Блокада Ленинграда) was a prolonged military blockade undertaken from the south by the Army Group North of Nazi Germany against the Soviet city of Leningrad (Modern Saint Petersburg) on the Eastern Front in World War II. The Finnish army invaded from the north, co-operating with the Germans until they had recaptured territory lost in the recent Winter War, but refused to make further approaches to the city. Hotel Astoria is a five-star hotel in Saint Petersburg, Russia, that first opened in December 1912. It has 213 bedrooms, including 52 suites, and is located on Saint Isaac's Square, next to Saint Isaac's Cathedral and across from the historic Imperial German Embassy. Hotel Astoria, along with its neighboring sister hotel, Angleterre Hotel, is owned and managed by Rocco Forte Hotels and is a member of The Leading Hotels of the World. The hotel underwent a complete refurbishment in 2002. The Generalplan Ost, abbreviated as GPO, was the Nazi German government's plan for the genocide and ethnic cleansing on a vast scale, and colonization of Central and Eastern Europe by Germans. It was to be undertaken in territories occupied by Germany during World War II. The plan was partially realized during the war, resulting directly and indirectly in the deaths of 9.4 to 11.4 million ethnic Slavs by starvation, disease, execution or extermination through labor, including 4.5 million Soviet citizens, 2.8 to 3.3 million Soviet POWs, 1.8 to 3 million Slavic Poles, 300 to 600 thousand Serbs and 20 to 25 thousand Slovenes. 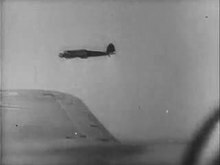 Its full implementation, however, was not considered practicable during the major military operations, and was prevented by Germany's defeat. In the south, the fortified line ran from the mouth of the Luga River to Chudovo, Gatchina, Uritsk, Pulkovo and then through the Neva River. Another line of defence passed through Peterhof to Gatchina, Pulkovo, Kolpino and Koltushy. In the north the defensive line against the Finns, the Karelian Fortified Region, had been maintained in Leningrad's northern suburbs since the 1930s, and was now returned to service. A total of 306 km (190 mi) of timber barricades, 635 km (395 mi) of wire entanglements, 700 km (430 mi) of anti-tank ditches, 5,000 earth-and-timber emplacements and reinforced concrete weapon emplacements and 25,000 km (16,000 mi)  of open trenches were constructed or excavated by civilians. Even the guns from the cruiser Aurora were moved inland to the Pulkovo Heights to the south of Leningrad. The two-and-a-half-year siege caused the greatest destruction and the largest loss of life ever known in a modern city. 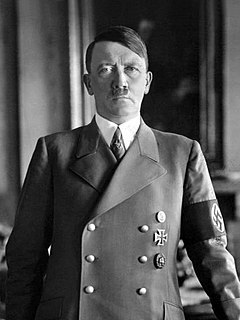 On Hitler's direct orders the Wehrmacht looted and then destroyed most of the imperial palaces, such as the Catherine Palace, Peterhof Palace, Ropsha, Strelna, Gatchina, and other historic landmarks located outside the city's defensive perimeter, with many art collections transported to Germany. A number of factories, schools, hospitals and other civil infrastructure were destroyed by air raids and long range artillery bombardment. The diary of Tanya Savicheva, a girl of 11, her notes about starvation and deaths of her sister, then grandmother, then brother, then uncle, then another uncle, then mother. The last three notes say "Savichevs died", "Everyone died" and "Only Tanya is left." She died of progressive dystrophy shortly after the siege. Her diary has been claimed to have been shown by the prosecution at the Nuremberg trials. 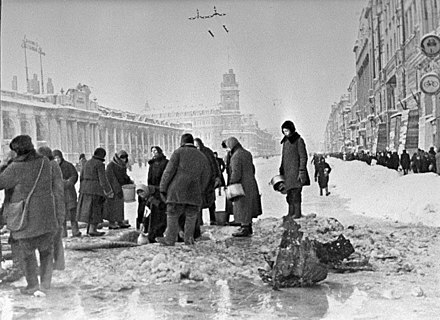 Civilians in the city suffered from extreme starvation, especially in the winter of 1941–42. From November 1941 to February 1942 the only food available to the citizen was 125 grams of bread per day, of which 50–60% consisted of sawdust and other inedible admixtures. In conditions of extreme temperatures (down to −30 °C (−22 °F)), and with city transport out of service, even a distance of a few kilometres to a food distribution kiosk created an insurmountable obstacle for many citizens. 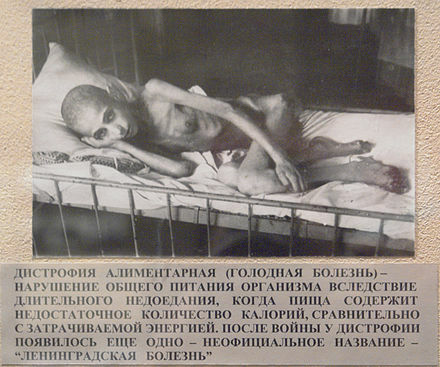 Deaths peaked in January–February 1942 at 100,000 per month, mostly from starvation. People often died on the streets, and citizens soon became accustomed to the sight of death. On 9 August 1942, the Symphony No. 7 "Leningrad" by Dmitri Shostakovich was performed by the Leningrad Radio Orchestra. The concert was broadcast on loudspeakers placed throughout the city and also aimed towards the enemy lines. The same day had been previously designated by Hitler to celebrate the fall of the city with a lavish banquet at Leningrad's Astoria Hotel,  and was a few days before the Sinyavino Offensive. The encirclement was broken in the wake of Operation Iskra (Spark), a full-scale offensive conducted by the Leningrad and Volkhov Fronts. This offensive started in the morning of 12 January 1943. 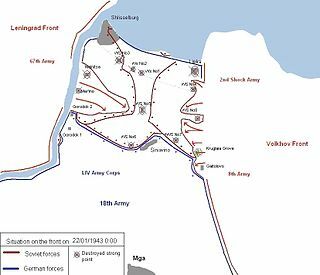 After fierce battles the Red Army units overcame the powerful German fortifications to the south of Lake Ladoga, and on 18 January 1943, the Volkhov Front's 372nd Rifle Division met troops of the 123rd Rifle Brigade of the Leningrad Front, opening a 10–12 km (6.2–7.5 mi)[ verification needed ] wide land corridor, which could provide some relief to the besieged population of Leningrad. 29 June: Construction of the Luga defence fortifications (Russian : Лужский оборонительный рубеж) begins  together with evacuation of children and women. The main issues which count in favour of the former view are: (a) the Finns mostly stayed at the pre-Winter War border at the Karelian Isthmus (with small exceptions to straighten the frontline), despite German wishes and requests, and (b) they did not bombard the city from planes or with artillery and did not allow the Germans to bring their own land forces to Finnish lines. Baryshnikov explains that the Finnish military in the region was strategically dependent on the Germans, and lacked the required means and will to press the attack against Leningrad any further. Although the Finnish Army had no other intentions besides regaining their own land lost in the Winter War, the advances made contributed greatly to the war efforts of Germany. The 142nd Rifle Division began service in August, 1939 as a standard Red Army rifle division, which participated in the Winter War against Finland. It remained on the Karelian Isthmus and had a relatively uneventful war facing the Finns until the Vyborg–Petrozavodsk Offensive began on June 10, 1944, from which point it saw much more active service. Following the end of the Continuation War, the division was transferred to 2nd Shock Army in 2nd Belorussian Front. Its soldiers distinguished themselves in the capture of the German city of Graudenz and ended the war fighting through Pomerania. The 281rd Rifle Division was an infantry division of the Soviet Union's Red Army during World War II. Formed in the summer of 1941, the division fought in the Siege of Leningrad until the end of the siege in early 1944, when it advanced into eastern Estonia. The 281st was soon moved north to fight against Finland during the summer of that year, and after Finland's withdrawal from the war fought in battles in East Prussia and Poland during early 1945. The division was disbanded in the summer of 1945. The 268th Rifle Division was an infantry division of the Soviet Union's Red Army during World War II. ↑ "Putin accepts Netanyahu invite to Israel to honor Leningrad siege victims - Israel News - Jerusalem Post". www.jpost.com. Retrieved 2019-04-08. ↑ Orchestral manoeuvres (part one), theguardian.com; 25 November 2001. ↑ In a conversation held on 27 November 1941, with the Finnish Foreign Minister Witting, Hitler stated that Leningrad was to be razed to the ground and then given to the Finns, with the River Neva forming the new post-war border between the German Reich and Finland. 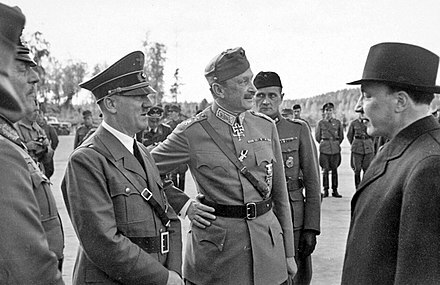 However, there was a command of Mannerheim in Finland for the country not to participate in the siege of Leningrad. ↑ "И вновь продолжается бой..." Андрей Сомов. Центр Политических и Социальных Исследований Республики Карелия. (in Russian). Politika-Karelia. 2003-01-28. Archived from the original on 2007-11-17. Retrieved 2007-09-25. ↑ Zaloga, Steven J. (20 October 2015). Gustaf Mannerheim (Command). Osprey Publishing. ISBN 1472814428. ↑ правды», Андрей МОИСЕЕНКО | Сайт «Комсомольской (2006-06-23). "Тайна «Дороги жизни»". KP.RU - сайт «Комсомольской правды» (in Russian). Retrieved 2019-04-08. ↑ "Д-2 "Народоволец"". web.archive.org. 2008-05-22. Retrieved 2019-04-08. ↑ Salisbury, Harrison (1969). The 900 Days: The Siege of Leningrad. New York: Harper & Row Incorporated. pp. 407–412. OCLC 364494. ↑ David T. Zabecki (2015). 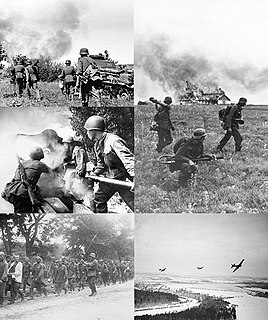 World War II in Europe: An Encyclopedia. Taylor & Francis. p. 1556. ↑ Bernstein, AI; Бернштейн, АИ (1983). "Notes of aviation engineer (Аэростаты над Ленинградом. Записки инженера – воздухоплавателя. Химия и Жизнь №5)" (in Russian). pp. с. 8–16. Archived from the original on 4 May 2008. ↑ "The Siege of Leningrad, 1941 – 1944" . Retrieved June 10, 2018– via EyeWitnessToHistory.com. ↑ "Monument to the Heroic Defenders of Leningrad, St. Petersburg, Russia" . Retrieved 26 September 2015. ↑ "Military Parade Marking 75th Anniversary of Leningrad Siege Held on Palace Square" (27 January 2019). TASS News Agency . Retrieved 3 March 2019. ↑ "Military Parade Marks 75th Anniversary Of End Of Siege Of Leningrad" (27 January 2019). Radio Free Europe/Radio Liberty (RFERL.org). Retrieved 3 March 2019. Benioff, David (2008). City of Thieves . Viking Penguin. ISBN 978-0-670-01870-3. Dunmore, Helen (2001). The Siege . Viking. 2002, Penguin. ISBN 0-141-00073-2.